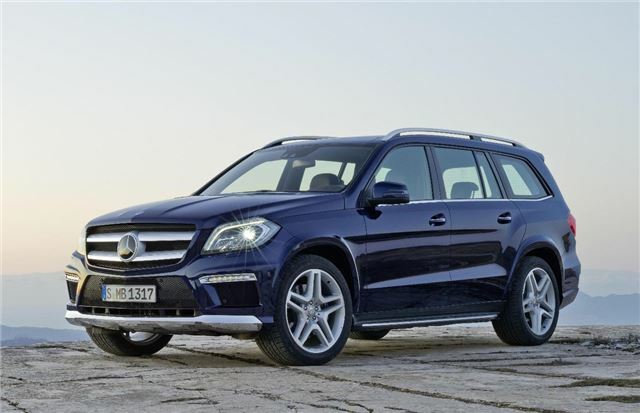 Mercedes-Benz has announced that its GL-Class luxury SUV will cost from £59,465 for the GL 350 BlueTec diesel and £91,680 for the GL63 AMG when sales start in January 2013. Standard equipment includes AMG styling, 21-inch alloy wheels, parking assist, COMAND infotainment system and DAB radio. The new GL-Class is slightly larger and more spacious than the model it replaces, with a roomier boot. It’s also more efficient – the GL350 BlueTec 3.0-litre V6 diesel’s fuel economy has been improved by 15 per cent to 35.3mpg, with emissions of 209g/km. It’s a fairly powerful engine, too, with 258PS and a hefty 620Nm of torque, meaning a 0-62mph sprint of 7.9 seconds and a top-speed of 137mph. Impressive figures for such a heavy vehicle. The AMG model will appeal to performance fans, thanks to a 5.5-litre V8 engine with an output of 557PS and a huge 760Nm of torque. Performance is sports car like, with a top speed of 155mph and a 0-62mph sprint time of 4.9 seconds. Unfortunately it’s far from efficient, with official economy of 23mpg and emissions of 288g/km. There are some new safety features fitted to the new GL-Class, including a system to keep the car on track after a gusting crosswind and Collision Prevention Assist, which gives an audible and visual warning if the driver gets too close to a car or object in front. Some of the key optional extras include a panoramic sliding roof, on- and off-road package, leather upholstery and a driving assistance pack, which includes adaptive cruise control and active blindspot assist. Production of the new model starts in January 2013.